Zarabande from “El Toro” Alfred Flores and his four-mallet quintet is the most exciting Latin jazz album that’s crossed my desk in a long time. Mostly uptempo and crammed with sparkling interplay, these nine original tunes, all by pianist Mark Little or vibraphonist Joe Caploe, glow with the unusual sound built entirely out of struck notes, nothing blown, not a reed or a mouthpiece in sight. The airy sustain of the vibraphone’s metal keys balances the wooden percussiveness of Flores’s marimba, the piano’s hammered strings, and the gritty rhythm section of Dean Macomber on drums and Peter Ojeda on electric bass. Each instrument gets plenty of chances to stand out, but it’s the punchy ensemble playing by these fine musicians, dancing out their coruscating Latin rhythms flecked with rock and steeped in jazz, that brings the thrills. An easygoing crossover vibe emerges from Victor & Penny’s new jazz-folk album Electricity. Backed by a small jazz combo, the guitar-ukelele-vocal duo of Jeff Freling and Erin McGrane present ten compact songs, all but one original, rooted in the styles of early jazz and proto-jazz. Among the good-time uptempo numbers, but the group gets sober and even solemn (“Say Goodbye,” “Hide. Seek.”), and darkly moody in a gyspy-jazz rendition of Sting’s “Moon Over Bourbon Street” where the presence of violinist Paton Goskie helps suggest the classic Reinhardt-Grapelli collaborations. Crackling arrangements and McGrane’s silky-supple vocals keep things energized throughout. The band shines on the exuberant instrumental “Penny’s Pounce.” Freling’s assured, even rock-inflected guitar solos help bend the old-time sounds towards the more modern, while McGrane’s hearty ukelele comping imparts a playful flavor to everything. Credit must go to producer Mitch Dane for slipping the uke’s limited sound spectrum into the mix just right. A different kind of crossover emerges on another recent album that I had meant to write something about awhile ago. 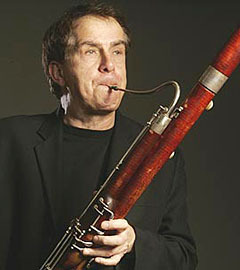 In a way, I’m too late: Renowned bassoonist Daniel Smith died in December 2015, shortly after the release of this interesting CD featuring adaptations of baroque music for bassoon and jazz trio, Scott Joplin rags, and an original three-movement “Jazz Suite for Bassoon” by pianist Steve Gray. The bassoon’s characteristically mellow tone is especially pronounced in a jazz setting where bright saxophones and brass are the norm. These adaptations of short pieces by Vivaldi, Purcell, Bach, and William Byrd therefore make a subdued kind of sense: Their scripted nature pulls the accompanying jazz players back to a circumscribed sound with only hints of jazz flavors. Jazz pokes out notably in the “Air on a Ground Bass,” with its switch to a swing feel and the faintly trombone-like tone Smith achieves in the bassoon’s high register. The rags too are brief and to the point, but the backing of the Caravaggio Ensemble’s string players gives a classical-romantic finish to the pieces. I imagine these arrangements accompanying a silent movie; you can sense the fun Smith had playing the sprightly, syncopated melodies. Gray’s “Jazz Suite for Bassoon” comes last but feels like the album’s centerpiece, with Smith backed by a jazz quintet including Gray on piano. The “Allegro” features some impressive unison passages. It begins with a sly Bernstein-meets-Piazzolla through-composed feel, then lopes into a rich swing groove before breaking down for a stunning, tongue-half-in-cheek bassoon cadenza. Vibraphonist Jim Lawless introduces the “Ballade” movement with a couple of eerie moments before the bassoon enters with a sad rubato melody, as of lost romance, replete with chromatic descents and heartbreaking chord changes. The lively finale is a mini-suite unto itself, incorporating a jaunty two-step, a lounge-y swing section, and moderate bop with a jiving solo by Smith; at the start it also ventures outside jazz into 20th-century modernism. There’s a palpable sense of fun that’s a fitting close to the late virtuoso’s final Summit Records release. R.I.P.